The future of touch screens has arrived with the second generation of Microsoft surface smart tables – the Microsoft Surface SUR40, which comes with a new touch-sensitive technology called PixelSense, created in collaboration between Microsoft and Samsung. 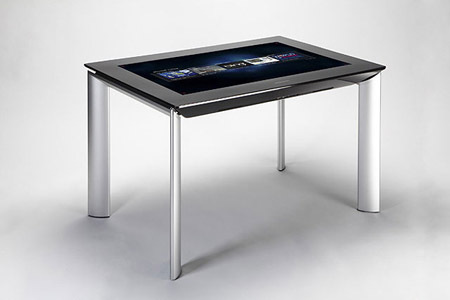 The SUR40 is a 40-inch touch display that can be used as either a horizontal or vertical surface. With new LCD technology created by Samsung, every pixel of the screen is transformed into a tiny infra-red (IR) sensor, allowing the LCD display to recognize over 50 simultaneous touch points. With a 4-inch-thick piece of GorillaGlass used for the display surface, the SUR40 is designed to handle the busiest commercial settings and educational institutions, which are seen as the primary consumers for the item at this time, considering that it has a pretty hefty price tag of $8,400 for just the display screen. The tabletop model costs $9,049. The SUR40 is powered by an AMD Athlon II X2 2.9GHz Dual-Core Processor paired with an AMD HD6750M GPU, and it has an app for the Microsoft Bing search engine and a built-in Web browser. Take a look at the videos below to get an idea of what the Microsoft Surface SUR40 can do. The first clip shows how the smart table can be used in a commercial or medical setting, while the second video gets a little more involved with the people that made the SUR40 a reality. If you have a commercial business in the United States, Australia, Austria, Belgium, Canada, Denmark, France, Germany, Hong Kong, India, Ireland, Italy, Korea, the Netherlands, Norway, Qatar, Saudi Arabia, Singapore, Spain, Sweden, Switzerland, the United Arab Emirates, or United Kingdom, and you want to see what the SUR40 can do for you, it’s available for pre-order now. Be the first to comment on "The Next Generation of Touch Arrives with Microsoft Surface SUR40"